TALF financed transactions have dropped off substantially in the July 7th round of operations. 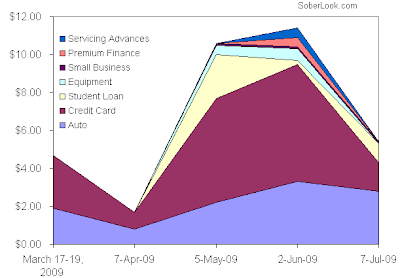 The chart below tracks TALF financing by category since the start of the program. The concept of "if you build leverage, they will come" just hasn't materialized. TALF as well as the FDIC guarantee program certainly helped to open some of the credit markets, but that doesn't mean the programs are being used to the fullest. The next TALF operation announcement on July-16th will show if any CMBS transactions have been done - there likely to be some. But the private sector is very uneasy taking on more leverage, particularly with the federal government (the same, by the way, also applies to the PPIP). Someone may actually make money doing this and worse yet pay bonuses with the profits, but in the new populist paradigm financial services firms shouldn't do either. 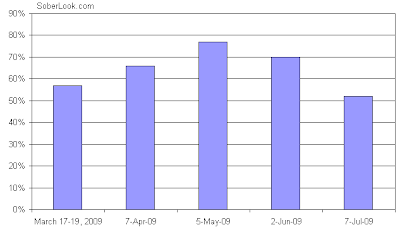 Some may argue that due to the summer slowdown, the amount of issuance is down overall, resulting in slower TALF usage. But the chart below shows the financing accomplished via TALF as a percentage of total TALF eligible transactions done - the program usage has clearly declined. If a transaction can be financed via private sources, the preference is to avoid the government program. 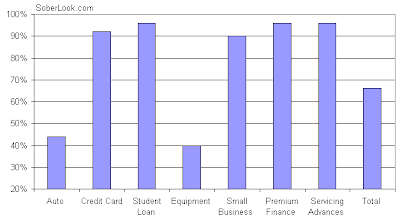 This next chart shows the percentage of TALF usage for the various asset classes. Equipment and Auto, being short-term fairly standard deals, often can be done privately. Other markets such as insurance premium finance are still shut down and rely almost exclusively on TALF. Overall about 67% of the eligible deals have been financed via TALF since the start of the program. Another issue with TALF is the Fed's continuing reliance on the rating agencies. The agencies are being extremely conservative to overcompensate for their errors of the credit boom days. Sometimes the subordination levels required for the AAA rating are so high, the returns on equity just don't make the deal worth doing.